eM Client 7 is launching! 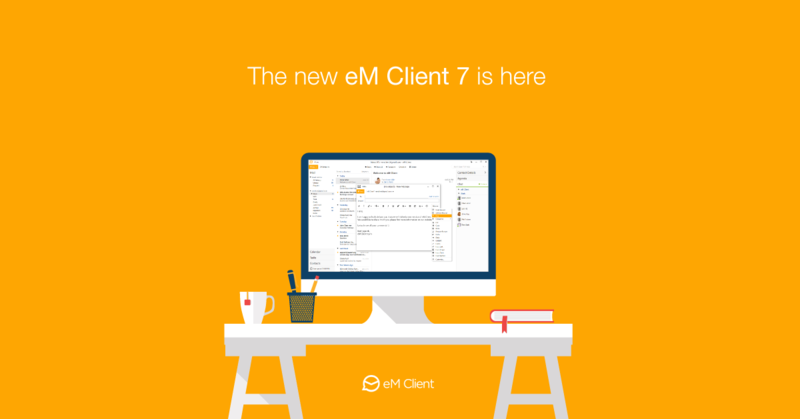 It has been a long road and a lot of hard work and finally we're proud to announce the release of eM Client 7. You can check out some of its features below as well as download the setup file. The interface has been completely redesigned. With a sleek, modern design and a lot of new original themes, eM Client looks better than ever. The long awaited conversation view is here. Your correspondence will now be grouped into relevant conversations, making browsing through messages easier than ever before. Do you often work late into the night and need something easy on the eyes or do you just like your applications in darker colors? Try the new official dark theme - we promise you'll love it! You can use the QuickText feature to send your own predefined blocks of text by simply clicking a button. Very useful if you find yourself frequently sending the same information repeatedly. You can now schedule mails to be sent at a defined time and date. Useful when you are communicating with someone from a different time zone or if you want your message to be sent while you're away from your computer. When you receive a message in a different language than the one you have set as default, eM Client can now translate the message with a single click. Owners of the Lifetime Upgrades Pro license can download and upgrade right away. Owners of regular Pro licenses will be required to purchase the appropriate upgrade to be able to use eM Client 7. Follow us on Facebook or Twitter to find the latest information about the new release.